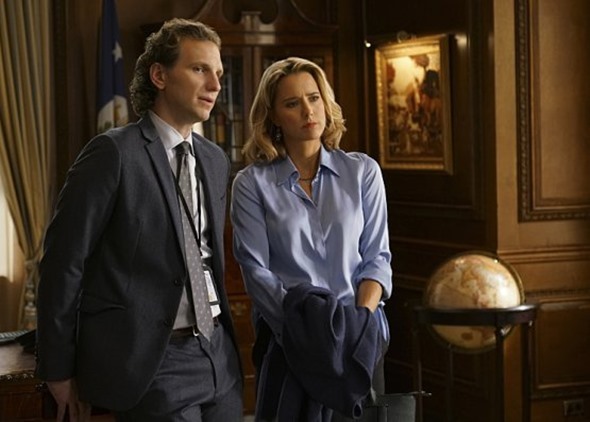 The Madam Secretary TV series has been renewed for a third season on CBS. The political drama, starring Tèa Leoni, Željko Ivanek, Bebe Neuwirth, Tim Daly, and Keith Carradine, was one of 11 series CBS picked up today. Madam Secretary features Secretary of State Elizabeth Adams McCord (Leoni). Clever and tenacious, she oversees international diplomacy, deals with office politics, and sometimes colors outside the lines, at work and at home. Along with the renewal CBS announces it will finish this television season as America’s most-watched network for the 13th time in 14 years. Here is the full list of shows renewed by CBS today: Blue Bloods, Elementary, Hawaii Five-0, Madam Secretary, Mom, NCIS: Los Angeles, NCIS: New Orleans, Scorpion, 2 Broke Girls, Survivor, and The Amazing Race. CBS previously renewed The Big Bang Theory and NCIS. What do you think? Are you a fan of the Madam Secretary TV show? Do you plan to watch the third season? Tell us. More about: Madam Secretary, Madam Secretary: canceled or renewed? The writer’s focus so far has been fresh, interesting, and nonHillary. If it slides into Hillary any more, it’s done for us. I am a democrat and sick of the forced feedings toward government as God mindset. Madam Secretary is every bit of good as West Wing and is currently the most relevant show on any channel. I am very pleased with this series. I find it very interesting and, although it is a fictional story, it is interesting to see possible problems from another perspective. I enjoy it very much and am glad it has been renewed. I very rarely watch TV, but every Sunday I make a point of watching Madam Secretary. The cast. is terrific, and the show is very, very well done. I miss it when it’s not on and am happy it’s been renewed. Our family has thoroughly enjoyed Madam Secretary; sorry to see another quality TV show eliminated. Watched “Good Fight Last Night” but when CBS wants to start CHARGING to watch TV shows BESIDES our paying for cable, our family will STOP WATCHING the major US channels and enjoy watching the many quality TV shows on PBS and BBC as well as any of the foreign channels we are able to get. BE CAREFUL OF GREED U.S. TV ~~ IT CAN BE YOUR DOWNFALL!!! I watch Madam Secretary regularly . Why is it always bumped??? Love this show…hate when it gets bumped!